Right before Christmas someone showed me a commercial, the premise of which was that men had to be very careful about the gifts they gave women because the wrong gift would land them in the doghouse. Apparently, demeaning, degrading gifts like household appliances or diet aids were the worst and the only foolproof gift a man could give was jewelry. This got me thinking about what kind of gift my husband could possibly give me that would merit that kind of reproof. My husband is very sweet and thoughtful and tries to give me gifts that he knows will please me. So when he gave me a washer and dryer, I didn't feel that he was demeaning me, assuming that my only job in life was to wash his underwear. On the contrary, I was thrilled! It's a fact of life that I do the laundry in our home and to finally replace the machines that I've cursed for the last ten years was a huge blessing to me. Likewise, when my son-in-law gave my daughter a treadmill for Valentine's Day, not only was he not in the doghouse, he was king of the day! His message was not "I'm skipping chocolates and giving you a treadmill because you really need to do something about your figure." Quite the contrary. He knew that she doesn't love chocolate and she really wanted to master treadmill dancing. His gift probably got him almost smothered in kisses. So, what would get my husband sent to the doghouse? Hmmmm. A new lawnmower? I'm not about to start mowing the lawn. But if it made my husband happier, a happy husband is a good gift. And I could always balance it out by buying him a new sewing machine. A gift that is always appreciated is pound cake. Especially when it's peppered with luscious, ripe blueberries. I know it's not blueberry season just yet (it snowed here yesterday! ), so you'll have to tuck this recipe into a safe spot and bring it out again when fresh berries show up in the grocery store, the farmer's market, or better yet, your own bush! 1- Preheat oven to 350 deg. F. with a rack in the center of the oven. Butter and flour a 12-cup Bundt cake pan. 2- Sift the flour, baking powder, and salt into a medium bowl. Set aside. 3- Place the sugar and lime zest into a food processor and pulse 20 times. If you don't have a food processor, you can omit this step and just work the zest into the sugar with your hands. 4- With an electric mixer, beat the butter and cream cheese at medium speed until smooth, about 1 minute. 5- Add the sugar mixture and continue to beat until the mixture is light and fluffy, an additional 1 to 2 minutes. 6- With the mixer running, add the eggs and egg yolk, one at a time, beating well after each addition, and stopping the mixer to scrape down the sides as necessary. 7- Reduce the mixer speed to low and slowly add the flour mixture. Scrape down the bowl and beat at medium speed for about 20 seconds. 8- With a rubber spatula, gently fold in the blueberries. 9- Pour the batter into the prepared pan and smooth the top with a spatula. Run a knife through the batter or gently tap the pan on the counter to eliminate any air pockets. Bake 50-55 minutes, until a cake tester comes out clean. 10- Set the pan on a wire rack to cool for 10 minutes, then remove the cake from the pan and let it cool on the rack to room temperature. 11- To glaze the cake, combine the confectioner's sugar and lime juice. Whisk until the mixture is smooth and runny, adding more lime juice if necessary. Pour the glaze over the cake and allow it to set before cutting. 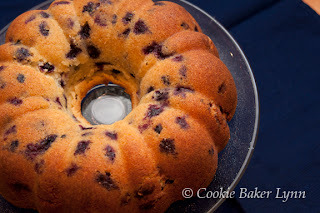 Note: as you can see from the photos, I skipped the glaze and the cake was still wonderful! I always find that I'm reluctant to give gifts that people "need" much prefering to give the gifts that people want, but sometimes they are one in the same. I often try to offset a new set of cookware (work) with something fun.. even though the cookware would be considered a great gift. (But I'm weird :)). this looks terrific, lynn. 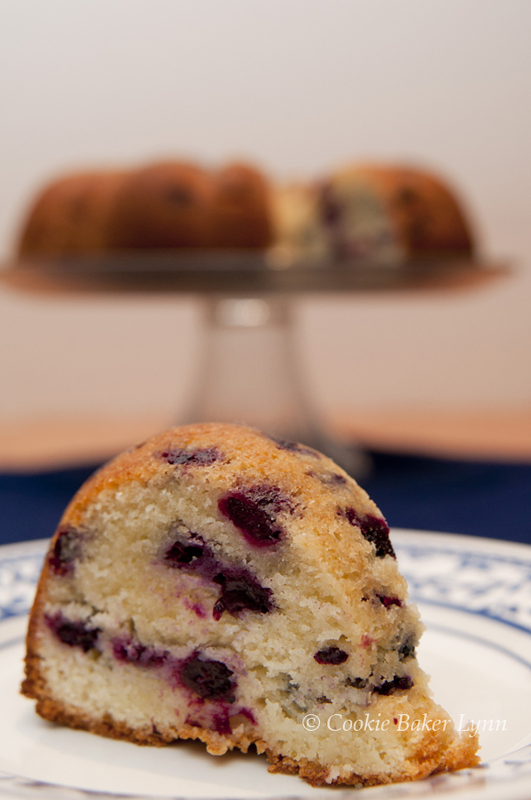 moist, yet still sturdy and full of berries! This is a recipe I know my family is just going to love. those colours drive you madly in love! That's such a gorgeous cake. YUM!